Southeast Meridian real estate includes some real gems that allow people living in the Treasure Valley to experience their community in a unique way. Of course, there are some beautiful homes for sale in SE Meridian, Idaho, but living in a community means that you venture out past the end of your driveway. Fortunately, for people living in these subdivisions, putting your jumping off point at this location in the Treasure Valley means that you gain easy and quick access to the best that both Boise and Meridian have to offer. On the Meridian side of things, the Majestic Theater represents one of the local destination locations that residents of SE Meridian can take advantage of. Movie buffs gather to enjoy buckets of popcorn with plenty of butter while the latest blockbuster or small romantic comedy plays on screen. This local theater plays year-round and counts as a favorite place to spend holidays like Christmas Day when the best holiday movies are released. But there's more to the Majestic Theater than just movies. People who buy one of the homes for sale in SE Meridian, Idaho learn that it's a popular place to hold a birthday or anniversary celebration as well. When residents in town rent out this space, they can even take in a morning movie or ask for a classic movie on-demand. It's just one of the town amenities that make living here so great. Of course, this and other destinations wouldn't be so convenient or quite as much fun if residents here didn't have easy access to I-84 to get them to where they need to go. Naturally, the freeway brings them right to the front doors of these amenities, but it does more than that. This portion of the freeway allows people who have bought homes for sale in SE Meridian to get to work, school and area restaurants quickly by bringing them directly to the Boise Connector or by allowing them access to major roads in Meridian such as Meridian or Eagle Roads. After a day of working at one of the area's employers like St. Luke's Meridian, Hewlett Packard or the Meridian School District, people who buy one of the homes for sale in Southeast Meridian can treat themselves to dinner at some great area restaurants. Along Fairview, they'll encounter mouth-watering steaks at the Texas Roadhouse or some chicken with a little spicy peanut butter sauce at Sa Wad Dee Thai Restaurant. The homes themselves offer examples of some of the best-built, most comfortable places to land after the day has reached its conclusion. These pieces of SE Meridian real estate offer a wide variety of features and amenities, giving people excellent home options no matter what their budgets. Some architectural features you might find in a home in this area include dual lamp posts in the front yard, a deep, cozy porch, a built-in fireplace in the family den, large, open kitchens with hardwood floors and extra cupboards for storage and even a swimming pool out in the backyard. Of course, not all of the homes for sale in Southeast Meridian, Idaho are large or feature swimming pools. Some embrace a more modest style of architecture that turns a heavily wooded yard into a nest for a modern cottage. But the spirit of these homes is exactly the same. They're the place where you unwind, work on school work with your kids or make plans for the future. They provide you with the jumping off point you need for Boise and Meridian to fully engage in your life and give you the means to do it. Great development opportunity in prime location near new development. 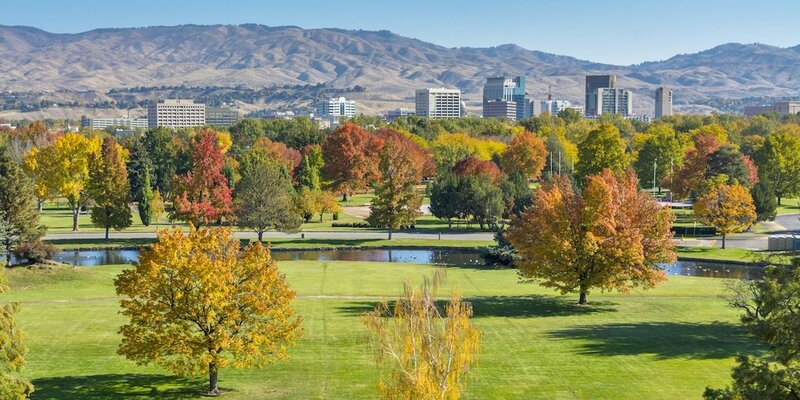 Great views of Boise Foothills and Owyhee Mountains. Sewer and Water within 250ft of property. Disclaimer: The Idaho Real Estate Center fully supports the principles of the Fair Housing Act. Click here for more information.